At all three of the CDU contra dances in March, 2019, the CDU has decided to do a trial using some new terms for the dance roles. The terms “Larks” and “Ravens” will be used for all the dances, to see how people like this new twist, instead of “Gents” and “Ladies”. 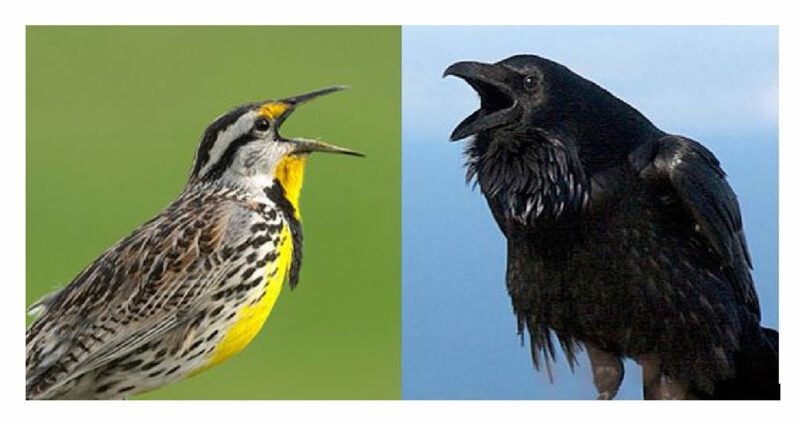 Nothing will change except the calls–Larks will be the term for the dancer on the Left, and Ravens for the dancer on the Right. You can still dance whatever role you like best! At the three Montpelier contra dances in March 2019, we are holding a TRIAL RUN of the terms Larks and Ravens to replace Gents and Ladies. Larks stand on the left after a swing, and Ravens stand on the right. The change of terms is the only difference — nothing else has changed. What’s wrong with Gents and Ladies? While it’s generally understood that your dance role says nothing about your gender, this does not change the fact that Gents and Ladies are inherently gendered terms. Because of this, many dancers feel pressure to dance a specific role. In addition, use of this terminology implies that men are Gents and women are Ladies by default, which is not true. While contra dance roles were strictly gendered in the past, these days folks of all genders regularly dance as “Gents” and/or “Ladies”. This is not just an issue of semantics. Some members of the community find the use of Gents and Ladies to be awkward, exclusionary, and even hurtful. Transgender and gender non-conforming people can be particularly affected by this issue. By switching to gender-free terms, we can make the Montpelier dance more welcoming and inclusive. Have other dance communities started using gender-free language? Yes! Several communities on the East and West coasts have permanently switched to gender-free language. Most recently, the popular BIDA dance in Boston recently made the change, as well as the dances in Amherst, MA, and Portland, ME. In Burlington, Queen City Contras and the Mad Robin dance are both discussing a change to Larks and Ravens. The Mad Robin dance is running a trial of Larks and Ravens in February, March & April this year. Many terms have been tested (jets & rubies, bands & bares, oaks & maples, ports & starboards, leads & follows, etc. ), but almost all dances that have switched to gender-free terms have settled on Larks and Ravens. What’s wrong with Leads and Follows? While this is an obvious choice for role terms in couple dancing, Leads and Follows works poorly for contra dance. First of all, Leads and Follows implies a dynamic of leading and following which, unlike other social dance forms, is not emphasized in contra dance. Also, Leads and Follows implies a power dynamic between the two roles, even more so than Ladies and Gents. If this issue weren’t enough, the terms Leads and Follows are awkward and confusing to call. For example, consider the calls: “Follows lead a hey for four” or “Leads, follow the Follows” or “Leads up, Follows down.” Again, this is not an issue for other dance forms. Why Larks and Ravens? Why the birds? These terms are kind of odd/quirky/fanciful. Larks and Ravens are by far the most popular terms used in gender-free contra dances today. The main reason for their popularity is that they are related directly to the meaning of the roles: The Lark starts with the letter ‘L’ and stands on the left after a swing, while the Raven starts with ‘R’ and stands on the right. After all, where you stand is the main difference between the two roles. Additionally, Larks is the same number of syllables as Gents, and Ravens is the same number of syllables as Ladies, making the transition easier. The words are not used in other contra dance calls, meaning that there is unlikely to be confusion. Most importantly, however, there is no implied power dynamics or gender/sexual connotations. That being said, we get it — the terms are kind of weird. They are not perfect terms, which is why we are not committed to using them yet. If you have other ideas, please let us know — either in person or via the feedback box! Enjoy an evening of dance! If the terms feel liberating, feel free to experiment with roles that you’re not used to. If the terms feel kind of awkward, don’t worry — only words have changed, nothing else! If you have always been a Lady, ending up on the right after swings, and you want to keep dancing as a Lady, just keep on dancing as a Raven, ending up on the right. Just be sure to ask your partner what role they’d prefer, if any. We will be formally collecting feedback via survey at the three March dances. After the March dances, we will switch back to Ladies and Gents and collect additional feedback at the first April dance. Then, the committee will review the results and decide whether to make a permanent switch. I have thoughts/feelings/opinions about this trial. How do I make my voice heard? In March or afterward, please feel free to speak to an organizer or leave a written comment in the Feedback Box! We’d love to hear what you think. There will be printed copies of this flyer at the front desk–and please do give us feedback, either in person, or with a note in the “Feedback” box. We really do want to know how this works for all types of dancers. “MLKJr “National Day of Service” Opportunity! Come when you can; do what you will. Click on the link above, and print out the application. Fill it out, and mail it to the CCG’s Secretary (address is on the form), along with a check for $30.00, or give the application, check (or even cash) to any Grange officer, and we’ll gladly add you to our membership! The annual VT State Session, which took place on Oct. 19 & 20th, considered the Resolutions which had been proposed by various Community and Pomona Granges. Here’s a link to all the Resolutions, with the State Session results highlighted. Some of the Resolutions were re-written by the appropriate State Session Committee, and then approved “as rewritten”. As the voting Delegate from Capital City Grange, I followed the wishes of the Grange members who let me know of the proposed Resolutions, as well as using my own judgement. My votes were sometimes with the majority, and sometimes with the minority.